The RAL is mainly used in the selection of paint colors in the fields of construction, industry, bodywork or road safety. The principle is to have color coded in a universal color chart. 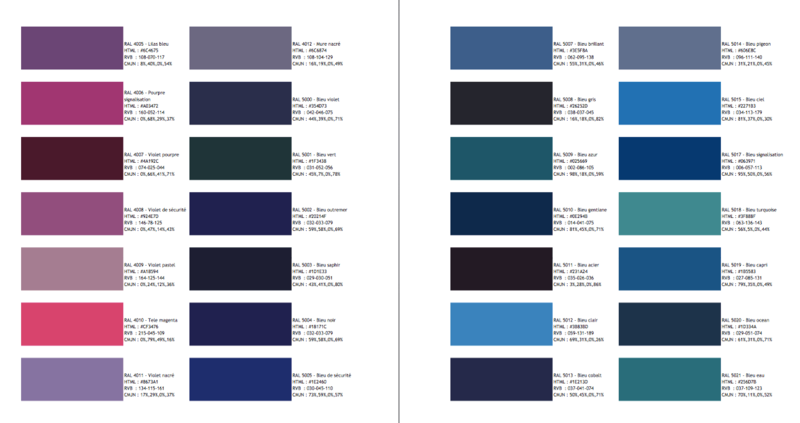 The RAL CLASSIC color chart contains 200 color coded as follows: each color is represented by a four-digit code, the first digit represents the hue and the last two the color code. Thus the code for the Cobalt Blue is RAL 5013. This principle allows the caller to know with the color accuracy and nuance that we designate. * The RAL is offered for information, The colors and their shades may vary slightly depending on the configuration of the computer screen. Download RAL chart pdf (HD). - HTML,RVB et CMYK codes (cyan, magenta, yellow and black composition). - price : 7 $ only ! Instead of 45 $.